What do Favorite Books and Characters Give Us? John Hemingway once said, “there is no friend as loyal as a book.” I am a firm advocate of reading books. I believe, as both an avid reader and writer, that knowledge is power and that there is always something to learn which will in some way make you a better person or perhaps a better writer. Books can be motivational and inspiring or draw us into a magical world that takes us far from our often hectic and lackluster world. Many of us have certain books that are like an old friend we can always rely on for encouragement or allow our minds to become creative. It’s interesting that Bradbury would be a fan of Edgar Rice Burroughs, since the same author is the one that started it all for me with the book “A Princess of Mars.” I have a very old hard cover of it sitting in my office in a glass enclosed case, in addition to a large number of his earliest paperback books that are prized possessions. My favorite character from his books that I’ve read would have to be John Carter from the Barsoom novels. He was the most singularly minded person I’ve ever encountered. He was always in control, never faltered, was open and honest and refused to give up no matter how hopeless the situation seemed. He openly loved the heroine of the story and was willing to move heaven and earth to be with her. He inspired me as a child and the books inspired me to become an author. How much more could anyone ask out of a series of science fiction books? Don’t get me wrong, I’d like to be more like him, but I cannot in good conscience say that I find myself in that person’s character. It’s just someone that I desired to emulate. He didn’t remind me of anyone in particular. A character of his caliber was larger than life, and inadvertently caused me to raise the bar of expectation to an unhealthy degree, at least so I’m told. Grab a book and Keep Reading! 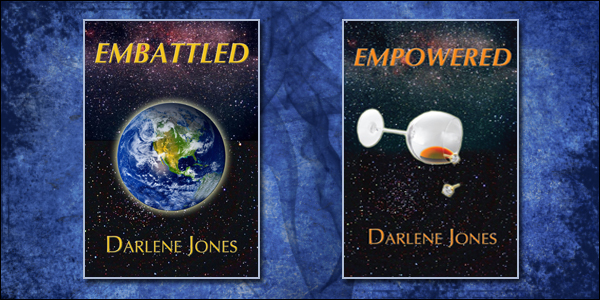 Today I have the pleasure of interviewing Darlene Jones, author of “Embattled” and “Empowered”! I’m a retired educator and have to say I loved working with junior high kids. All my elementary teacher friends thought I was crazy. I read of course and spend time with my granddaughter and I body board when I’m in Mexico. I also workout regularly as writing involves too much sitting. Is there anyone who has influenced/encouraged you to write? Who and how/why? Writing is something I always wanted to do, but my writing partner is the one who keeps me going. We exchange files for critiquing. The process of giving and getting feedback is so motivating. Not really any one book, but all of the books I liked and thought were well written have influenced me to try to achieve that level of writing skill and expertise. Ah! It’s a long story (http://emandyves.com/writing_blog.html). The short version is that I went to a writers’ conference in Portland and all the talk was about self-publishing. When my writing partner and I got identical rejection letters from one of the agents we met there for two very different books, we decided to self-publish. How did you choose the genre you write in? I didn’t think genre at all. I told the story to myself in bed at night when I suffered from insomnia. It didn’t help me to sleep and eventually I just had to write it down. Do you work with an outline, or just write? With the first book I just wrote. Now I use a general outline. Much more efficient. it published that you would change? Yes! I wouldn’t bother going through all the stress of trying to get an agent. How did you come up with the title for your current novel? Titles are so hard. I chose the “em” words, EMBATTLED and EMPOWERED, for my heroine, Em. My third book is EMBRACED and will be available soon. idea you’d love to work with? I’d love to work more with the theme of making our little corner of the world a better place however we can. Have you ever considered writing a book in first person with a male lead character? No, but you’ve given me some food for thought. I’m reading one like that now and it’s well done. What is your favorite part about being an indie author? Having the control for my work. Good reviews are always the best compliments. Here’s part of one I received recently. “A fascinating and original novel by Darlene Jones, EMBATTLED, wraps the reader in its tendrils the within in the first few chapters.” Nice, eh? None of the criticisms have been really tough, because they have been valid points and have helped me to improve the next book. Can you tell us about your upcoming project/book? In EMBRACED, Abby hears clicking in the fillings of her teeth and thinks they are messages from outer space. Do you have any advice to give to aspiring writers? Join critiquing groups and have a writing partner. You really need that second set of eyes and the best ones belong to a fellow writer. They know what to look for, what you are going through and are best able to help. Initially, I intended to write “a” novel. The story and characters took over and the ending of EMBATTLED demanded another. EMPOWERED is that “other.” I’ve always believed we can’t be the only beings existing in the vastness of the universe, There must be others “out there somewhere” and I’d like to believe they’re not all that different from us. Those beliefs are reflected in my writing. My novels stay, for the most part, within the realities of our world, but I’ve found that I love the magic the sci-fi element of other beings could bring to a story. With blood on her hands, strange words coming out of her mouth, and her face all over the media, Em knows that she did stop the jungle battle, storm into the armed courtroom, face and defeat the zealot soldiers. But, “working” for the powers controlling her, she is haunted with not knowing about or being connected to her own life. And, at some point she will have to decide which of her two lives are her true destiny. Yves, her controller, has his own set of problems as a rookie learning to be a Power, trying to communicate with Em, facing her doubts and questions as well as his own, and struggling to control the onslaught of emotions that arise from his association with humans. He risks losing his chance for advancement, his chance to free his people, even his life, by falling in love with Em. The power of Jasmine’s childhood visions convince her that she cannot be harmed. But trusting these visions can lead her into danger, possibly even death. Jasmine pursues Victor relentlessly, believing he is her soul-mate. But, the visions promise much more than a lover. They warn of a threat to Jasmine’s perfect life. She will wrestle with unknown forces that drive her, and with the knowledge that she has lived before. Who was she in that other life? Why is she so sure she is invincible? Where will her beliefs lead? And Yves? He is the celestial being assigned to watch over her, and to provide the people to protect her. He must experience again the agony of losing the woman he loves to another as Jasmine and her lover fulfill their destiny. Will Yves jeopardize his rise in power by going to her on Earth? Will he give up his love? Or, will he bring her back in yet another reincarnation? 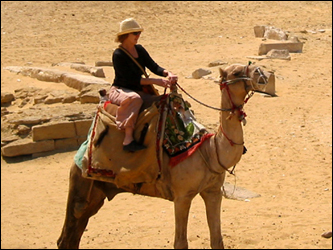 I am a writer whom journals about life, family, New England, everything and nothing and whispers of the Holy Spirit. The End is only the Beginning.